Round sound crowned or downed? Stick around. These speakers don’t carry the same level of finesse, innovation, or ingenuity that recent efforts in Logi’s peripheral line have achieved. 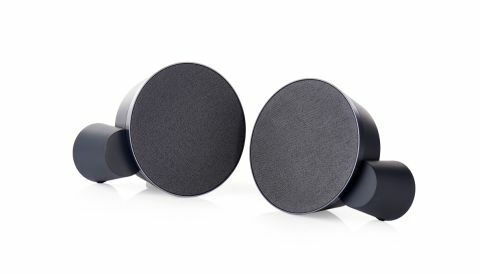 Give Logitech's flair wizards their due: The MX Sound speakers are a handsome pair. The super-flat cloth-covered drivers, in neutral gray, avoid calling attention to themselves, yet unavoidably become a focal point on your desk. They go so far into neutral that they come out the other side, their absence of visual noise drawing the eye like an optical illusion, particularly if your usual PC environment is busy. Their clever circular shape, which stands each speaker at a 20-degree ear-pointing lean, by resting on the rear of the outer bass tube, is pretty cool—although it leaves each speaker unit with an unusually wide footprint, which places heavy demands on your available space. What controls there are—white LED volume buttons and a Bluetooth connector/indicator combo—remain hidden behind the cloth of the right speaker, until they eerily light up when you bring your hand near. While the cloth is likely to become filthy if you poke them with any regularity, they’re useful enough. Thankfully, the MX Sound set is smart enough that you don’t need any more controls. The right speaker includes a pair of 3.5mm sockets for individual inputs, and Bluetooth makes three. Switching between them is seamless. Pause one, play the other, and you’re away; or hell, why not play multiple sources at the same time? The Bluetooth connection seems strong and connects without argument, but be prepared for some volume fluctuations if you’re switching sources, as the MX Sound automatically flips to your device’s Bluetooth volume level if you start playing wirelessly, or even if your phone happens to ding out an alert. There’s an additional 3.5mm jack for headphone output, which cuts the signal to the speakers if you have your cans plugged in, but it’s a shame that’s as far as the pass-through goes. If you’re a serious headset user, you’re probably already using a USB connection, but some way of routing a microphone through to the PC would have been handy—and a speakers/headphone toggle even more so. For true aural bliss, check out our guide to the best computer speakers right here. It’s hardly worth griping about what could have been, though. What’s there is good, in terms of construction and design. So how about sound? Logitech’s all-too generic boast is that these 24W peak speakers “deliver balanced audio that accurately reproduces the sound the artist intended.” Perhaps. Maybe if you manage to position the speakers so that their bass response tubes fire well, and you also place your head in precisely the right sweet spot, because these are some of the most directional and environmentally dependent desktop speakers we’ve ever heard. There’s no doubt their overall balance is pleasing and powerful, with decent low-end rumble and great stereo separation. They generally sound great when firing out music. There’s no distortion when driving them hard, no noticeable dropped frequencies when running quiet. It’s a well constructed musical sound stage. Listening to speech, though, can highlight a distracting tubular reverberation in the mid-range—an artefact of the bass ports—and moving one’s head even slightly from the mid-point between the speakers makes a jarring difference, unless they’re sufficiently deep-set on your desk. Realistically, we’re picking a lot of holes in what is a stylish, competent set of 2.0 speakers, pitched at just the right price point. They’re by no means a disappointment. These speakers, though, don’t carry the same level of finesse, innovation, or ingenuity that recent efforts in Logitech’s peripheral line have achieved. They’re good, but not exciting.